by PaulEMoz in "PC", "Terry Cavanagh", "Top 10 of 2010", "Top 10 video games", "platform", "vvvvvv"
But I don't mean that in a bad way. 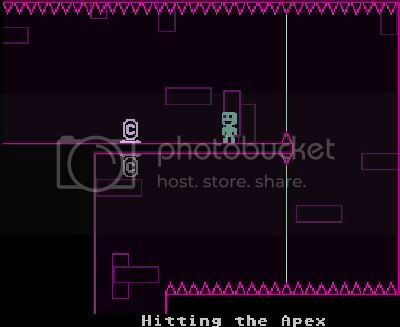 VVVVVV is a platform game in the grand tradition, albeit with a slight twist. You can't actually jump... instead, you can do a gravity flip. So from running along a floor, you'll flip onto the ceiling. And then you'll flip back down onto the floor. It takes a bit of getting used to, but once you do it works well, and lends itself to some pretty tricky puzzley manoeuvring. Stopping you from getting about are spikes... that's where the game gets its title from. In another homage to the old-school platformers, each screen has its own name. Unlike those games, you might not spend long on some of those screens. You whizz about at a fair old pace... too fast if you're not careful. It's all too easy to overcook it and land on a rack of spikes. Ouchie. Who the hell builds a spaceship like this, anyway? 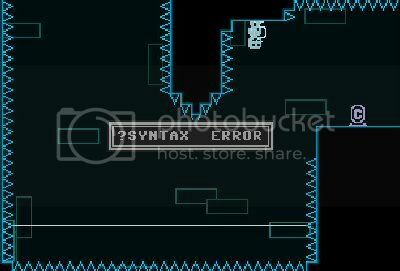 I've bought VVVVVV twice now... once it was released on Steam, I picked up a second copy in the sale, and it's now only £3.99 at its full price, so I'll once again recommend it to anyone that's a child of the Eighties and loved a rock hard platform game. I was torn about whether or not to put this above Hydorah, but despite its difficulty I actually progressed further with VVVVVV than I did with Hydorah and had more nostalgia-fuelled giggles, so although I probably enjoy Hydorah a little more now, VVVVVV just squeaks in as my eighth most-enjoyed game of 2010.